Wetlander Cruises – Relaxed cruising on the Gunbower Creek a remarkable environment of diverse waterbirds, wildlife and aquatic plants. Relaxed cruising on the Gunbower Creek, a remarkable environment of diverse water birds, wildlife and aquatic plants. Enjoy a peaceful dining experience with Breakfast, Lunch or Dinner. Enjoy a delicious meal on the cruise for either breakfast, lunch or dinner. Take either a 1.5 hr or 2 hr cruise on the Wetlander while dining and enjoying the scenery. 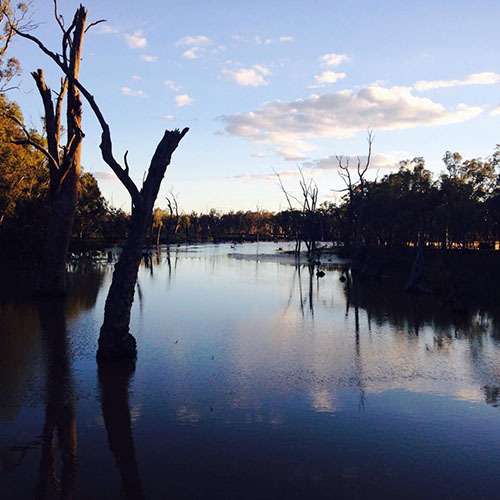 Explore a majestic environment cruising the Gunbower Creek. Serene, relaxing and very quiet, saw some nice wildlife, plenty of time to enjoy and the scones, jam and cream, they were divine! A relaxing cruise along the Gunbower Creek. We enjoyed the lunch cruise (12:30-2) and the two courses were delicious. Great commentary and friendly service. Seating is at tables in an enclosed area, plus you can go upstairs to the top if you wish. Cruising on the Gunbower Creek with Wetlander Cruises was a lovely experience. The evening was very relaxing, The scenery was beautiful and the food delicious. Staff were very helpful and courteous. A lovely evening. Pick an available cruise and book. Pre-pay for your cruise through our online booking system. Bookings are essential. A free courtesy bus will leave from Barham, picking up guests in Koondrook and along the way. Alternatively, meet us at the Wetlander mooring (Southern Rd). At your allotted time, board the Wetlander. Relax and get ready for an experience of a lifetime. Tucked away in the Murray Valley region you'll find a unique wildlife habitat listed with the Ramsar Convention as a 'Wetland of International Significance'. Gunbower Island boasts a diverse wonderland, inhabited by waterbirds, wildlife and aquatic plants. And as the largest inland island in Australia, it is an exquisite and unparalleled landmark.